Class II: Easy. 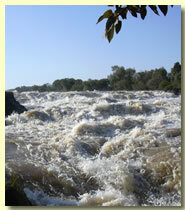 Rapids with regular waves, clear passages and wide channels. Class III: Moderately difficult. Irregular waves, often narrow channels, maneuvering to avoid obstacles required. Class IV: Difficult. Complex channels with many significant obstacles to be avoided. Precise maneuvering is required. Class V: Extremely difficult. 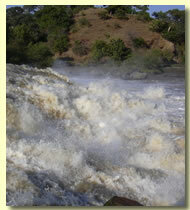 Long violent rapids, often following each other almost without interruption. Class VI: Generally considered unrunnable. Whether you are a first time rafter or extreme whitewater veteran looking for something new, you will find it all on Ethiopia's Blue Nile. The relatively unexplored section of the Blue Nile River between Lake Tana and the Blue Nile Falls has everything from beautiful calm water floats to screaming Class V whitewater. There is excellent access to the river throughout, allowing for a variety of possible trips. At Nile River Safaris we offer 1/2 day to 4 day trips, with mellow to extreme whitewater, overnighting in cute local Inns or comfortably camping along the river. Custom Itineraries available right after or before your all inclusive holidays Egypt.